I’ve been thinking of an appealing and tasty dessert to offer you for Thanksgiving. Many of you already know that muffins are my thing, and lately I’ve preferred to use soaked grains instead of flours. You might think that it’s too fussy. Think again! It’s just the matter of putting the grains to soak and the rest is done by water. Moreover, you only need to use the blender to prepare the batter leaving you with less dirty dishes to deal with. 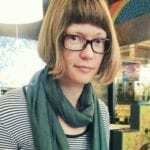 So, it is not a surprise that I come out with another muffin recipe. 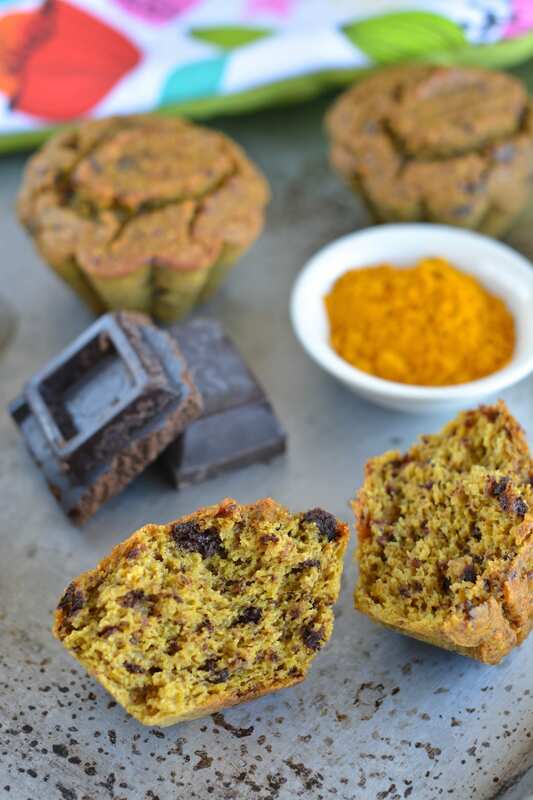 I tried turmeric in this recipe giving the muffins the most beautiful yellow colour – perfect to add onto your Thanksgiving table. Now, if those of you who don’t like turmeric are afraid of the taste, I can set your mind to rest – you won’t notice the taste, but just have the nice yellow colour and its’ beneficial qualities. 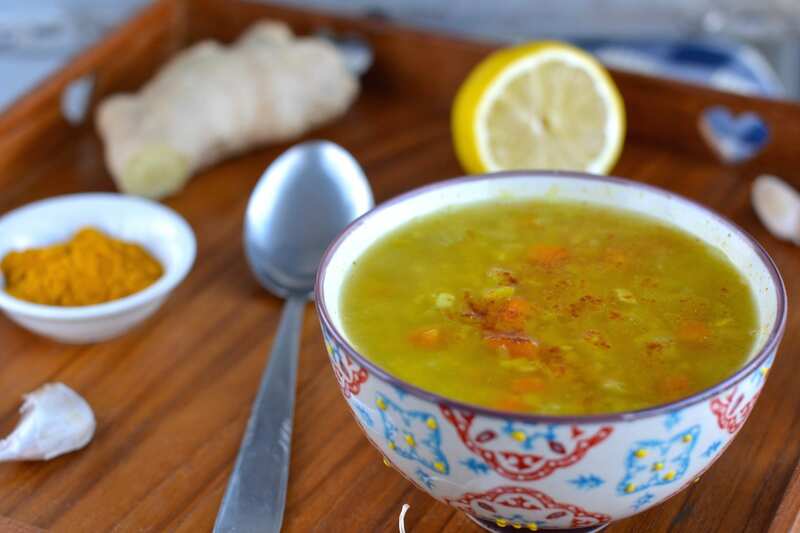 Turmeric is known as natural remedy for cough and the snuffles. 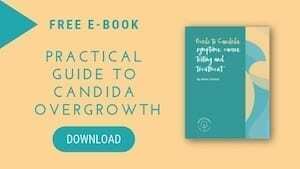 Also, studies show that it might be helpful when fighting infections, reduces inflammation and treats digestive problems. 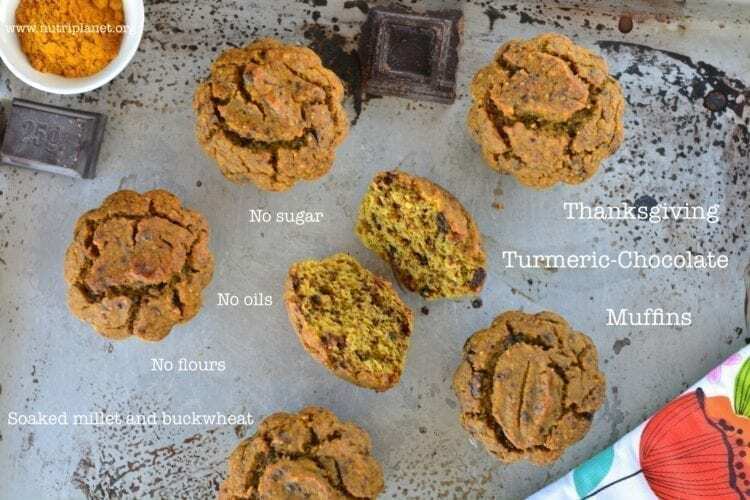 The turmeric-chocolate muffins make a healthy treat as the recipe uses only whole food plant-based ingredients, containing no refined sugars and also being oil-free. Should it be of any importance to you, the recipe is also gluten-free (make sure you use gluten-free oat milk or replace it with almond, rice or soy milk). Soak chopped figs in 210ml oat milk for 30 minutes. Put all ingredients except baking powder and chocolate in blender and blend until smooth batter is formed. Don’t worry; it’s supposed to be fairly liquid as millet swells quite significantly. Divide the batter between 10-11 muffin forms and bake for 33-35 minutes until the muffins are golden. These muffins also make a delightful Thanksgiving breakfast or mid-morning/afternoon snack with tea or coffee. I have use turmeric, but never in a sweet recipe. This is the perfect recipe to try, I live in Mexico so buckwheat and millet are almost impossible to find arund here, any recommended substituitions? You can substitute buckwheat with quinoa (same quantity). You can find millet (granos de mijo) here for example: http://www.organicosenlinea.com I think it’d be available in organic shops as well. You can also try my Spicy Cherry Poppy Seeds Muffins and add 1 tsp. 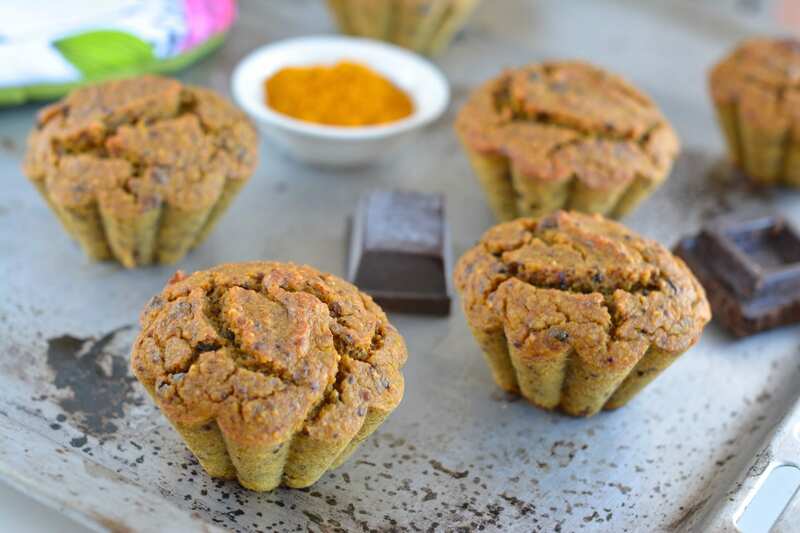 of turmeric to the recipe https://www.nutriplanet.org/2015/07/spicy-cherry-poppy-seed-muffins/ and substitute buckwheat flour with spelt flour. I hope it works out for you! Enjoy baking and eating!